This brightly colored vintage poster-map was printed by the French government to promote its national airline, Air France, in the government’s attempts to rebuild the French economy in the years following the disastrous consequences of WWII. Air France posters are renowned among collectors and highly sought after. This poster illustrates the airline’s services to various international destinations. Each destination is designated by easily recognizable illustrations of widely-known landmarks of that country, or other stereotypical images by which the destination country would be identified. Among the airlines of the world, Air France has always gone to great lengths in promoting the services it provides to the world, and issued a series of posters of stunning design. All are highly collectible, especially the Planisphere series to which this poster belongs, designed by Lucien Boucher. 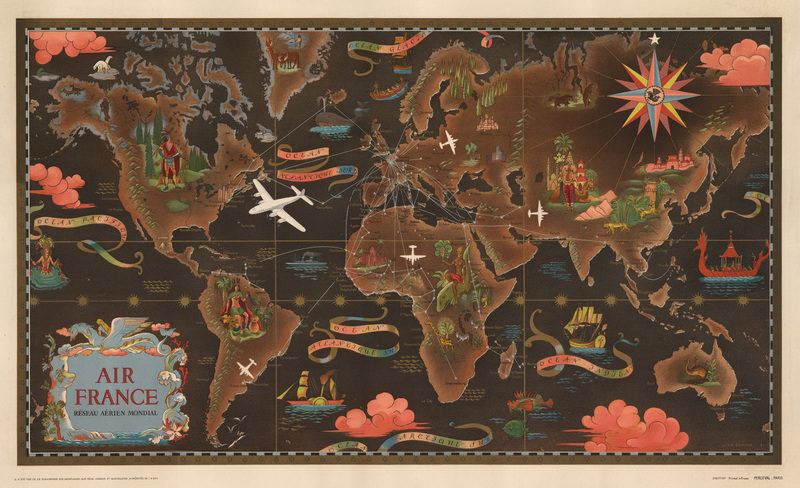 This is one of Lucien Boucher's more iconic surrealistic map images, a scarce large format edition of his 1947 pictorial map of the world showing the routes of Air France. Boucher started producing maps for Air France as early as 1933. Boucher's work for Air France is considered an embodiment of the golden age of air travel. This map, presented as a double hemisphere celestial, was drawn and published in 1947. The present example illustrates the Americas with stylized indigenous American Indians, Australia with ostriches and Asia with exotic Garuda barges, tigers and temples.